1. WHAT CERTIFICATIONS/CREDENTIALS DO YOU HAVE AS AN EMR VENDOR? In Touch EMR is a fully integrated scheduling, documentation and billing software for physical therapy practices. You can find us on the web at www.new.intouchemr.com. In Touch EMR is simple and user friendly web-based, ICD-10 and HIPAA compliant EMR, and it offers customizable templates for notes, the ability to attach files, electronic signatures, and the ability to track progress notes, treatment plans, and assessments. We charge a flat fee per licensed clinician (no hidden fees or surprises) and it includes everything, unlimited claims and notes and infinite custom template creation. We are also a CMS recognized PQRS registry, we automate the reporting of PQRS and Functional Limitation G codes and provide automatic alerts for plan of care expirations, authorizations, progress note reminders and KX modifier alerts. We are the first and currently only vendor in the rehabilitation space to be on the prestigious, certified Health IT Product List, which is a division of the office of the National Coordinator for Health Information Technology, a division of the Department of Health and Human Services. In Touch EMR is certified by ICSA Labs, an Office of the National Coordinator – Authorized Certification Body (ONC-ACB) and is compliant and in accordance with applicable criteria adopted by the Secretary of Health and Human Services (HHS). Click the button below to learn more about In Touch EMR founders and its technology partners in the news. 2. WHICH AUDIENCES DO YOU SERVE AND HOW ARE YOU DIFFERENT FROM OTHER EMR COMPANIES? We primarily work with private practice owners in the rehab, speech therapy and mental health community. We are more than an EMR company and practice management solution. We are led by private practice owners who have helped thousands of private practices increase revenue with efficient marketing, documentation, billing and coding since 2007. Our executive team understands your practice needs a lot more than an EMR. We solve a deeper, more fundamental need. You can click here to learn more about our team, before you schedule your demo. We simplify and automate the before, during and after practice workflow with a patent-pending workflow. You’ll document quickly, bill immediately to get paid faster, use text/voice appointment reminders to reduce cancellations, emailed newsletters, automated follow up mechanisms and referral generation techniques to increase referrals from patients, physicians and the community. You’ll grow your practice with In Touch EMR. Bottom line – By automating a significant number of things in the before, during and after practice workflow, we help you grow your practice by cutting costs and boosting staff efficiency. Finally, here is how we compare with other vendors. 3. DO YOU HAVE TRAINING MATERIALS THAT WILL ALLOW MY STAFF TO BE UP AND RUNNING QUICKLY? Absolutely! As soon as you come onboard, you’ll get access to a self-paced, video training program for clinicians, so they can master In Touch EMR in 2-3 hours. You’ll also get access to a self-paced, video training program for your biller, so he or she can master the billing software in 2-3 hours. Billers and clinicians have been able to master the use of In Touch EMR and In Touch Biller Pro in one afternoon. Unlimited training – All staff members also get unlimited phone, email and live chat support from 9 a.m. – 5 p.m. EST, Monday through Friday. 4. WHAT IS INCLUDED WITH EACH SOFTWARE LICENSE? Clients also get self-paced video training program on how to get up and running, custom documentation template builder, iPad app – one touch document import, Instant IntakeTM iPad app, unlimited patient manager and patient portal. Every license unlimited ongoing support (phone/email/live chat), billing software integration, unlimited appointments, unlimited documentation, unlimited document uploads and unlimited electronic faxing. At In Touch Biller Pro, every license includes unlimited ongoing support (phone/email/live chat), billing software, clearing house charges, unlimited claims, eligibility and ERAs and unlimited custom reports (subject to our fair use policy as stated in the In Touch Biller Pro contract). We also accept, and in some cases require, bank EFT information for payment. For more questions, please click here to contact one of the customer support superstars at In Touch EMR. We are fanatical about customer support and you’ll see why when you reach out to us. We can’t wait to hear from you. We look forward to hearing from everyone, whether you are a customer or not! 6. DO I HAVE TO INSTALL IN TOUCH EMR ON ALL MY COMPUTERS? The good news is – no installation is required. As long as you have an Internet browser, In Touch EMR will run and no installation process is required. We recommend Firefox or Chrome as your browser with In Touch EMR. In Touch EMR is ready to use from any computer with an Internet connection or any android/iOS device including iPad. In Touch Biller Pro, which is the scheduling and billing software, is best used on a PC or Mac with Firefox or Chrome. 7. WHAT IF I HAVE ONE CLINICIAN, ONE FRONT DESK PERSON AND ONE ASSISTANT/AID IN MY CLINIC - HOW MUCH DOES THAT COST ME? Here’s the good news. You’ll only pay the licensing fee of $49 per month for the licensed clinician. There is no separate license fee for additional staff members (non-licensed clinicians) however, each user with a unique credential (a username and password) is subject to a $10 monthly fee for ongoing access to the In Touch EMR program, server utilization and personalized access rights/capabilities. There is also a nominal, additional monthly fee for PTAs to schedule and document in In Touch EMR. Every license includes unlimited ongoing support (phone/email/live chat), billing software integration, unlimited appointments, unlimited documentation, unlimited document uploads and unlimited electronic faxing. Unlike other products, your billing is primarily based on the number of licensed clinicians who use the system. This is where the cost difference between us and our competitors starts to become significant. 8. IS MY PATIENT DATA SAFE AND ARE IN TOUCH EMR AND IN TOUCH BILLER PRO 100% HIPAA COMPLIANT? The privacy of patient data is a joint responsibility between the clinic and In Touch EMR. In Touch EMR is certified HIPAA compliant and all information in the program is password protected. Only authorized users can login to the system. All login IP addresses are tracked. Audit logs are mentioned. All hosting is done in with ClearDATA, the only cloud computing company that’s focus is exclusively healthcare. With ClearDATA, we are focused on safe, secure healthcare. This is achieved with a powerful combination of information security, infrastructure reliability, and cost reduction. As the only healthcare-exclusive cloud hosting company, ClearDATA provides an unmatched depth of expertise in the complexities of HIPAA compliance. ClearDATA’s platform, processes, security measures, and resources are all meticulously built from the ground up to exceed the highest standards in compliance, backed by an extensive BAA. ClearDATA is the healthcare industry leader in HIPAA cloud computing, platform and information security services. More than 300,000 healthcare providers rely on ClearDATA’s secure, HIPAA-compliant cloud infrastructure to store, manage and protect their patient health information and critical applications. In Touch EMR users enjoy secure, high-performance cloud computing infrastructure that exceeds strict HIPAA and HITECH regulatory requirements to deliver unrivaled compliance. Our secure cloud computing and cloud hosting platform delivers state-of-the-art protection, including real-time monitoring, data encryption at rest and in motion, intrusion prevention, multi-tier authentication, and much more. Expect 100% redundancy, 100% network uptime, 100% assurance of IT business continuity, 99.999% server uptime (.001% is for scheduled maintenance) and high availability, fast application speed with high performance bandwidth connections and real-time network and system monitoring to immediately identify any potential problems. The HITRUST Common Security Framework with ClearDATA is a certified framework that provides healthcare organizations with a comprehensive, flexible and efficient approach to regulatory compliance and risk management. Your patient data is safe. ClearDATA’s industry-leading security measures include around-the-clock monitoring, intrusion detection and prevention, data encryption in motion and at rest, dual-factor authentication, enterprise hardware, and more. Geographically distributed, top-tier rated, SSAE 16-compliant data centers enable ClearDATA to offer industry-leading SLA guarantees of 100% network uptime and 99.999% infrastructure uptime. We guarantee you will be able to access your data 24 hours a day, 365 days of the year. In healthcare, more than any other industry, seconds count. Regardless of day or time, urgent response times, skilled support technicians, and rapid resolutions are critical. We call this “Healthcare Critical” support, and this is our commitment to its customers. Enjoy the benefits of high-performance cloud computing. The ClearDATA converged cloud infrastructure features the latest in enterprise-grade hardware from the top brands in computing, state-of-the-art data centers, multicarrier connectivity, advanced network configurations, 24/7 monitoring, and more. We help protect your data and grow your practice with the most trusted and secure choice for website protection. The In Touch EMR website security solution features the EV SGC certificate from Comodo and the green address bar, the most recognized trust mark on the Internet. EV SGC expands SSL technology to a wider range of customers, since it enables older, weaker 40 or 50 bit encryption to step up to secure 125/256 bit encryption. The dynamic, ‘point-to-verify’ feature delivers real-time verification of business identity. 2048 bit private keys are used throughout certificate, further improving security of data. The green browser address bar provides conspicuous visual verification of the confirmed identity of In Touch EMR. Users enjoy the strongest possible level of SSL encryption with vulnerability assessment and round-the-clock malware scanning to help defend against attacks. Your data is in safe hands at In Touch EMR. Enjoy military grade encryption with 128-bit minimum to 256-bit with extended validation and full organization authentication. The extended Validation is only given to online businesses that can be verified through secure authentication processes that meet the extended validation guidelines established by the CA/Browser Forum. To learn more about the Comodo SSL architecture and the next level in visual authentication, please click here. 9. IF I HAVE A WIRELESS INTERNET CONNECTION AT HOME AND AT THE OFFICE, CAN I USE YOUR PRODUCT? As long as you have an Internet connection (wired or wireless), you can use In Touch EMR or In Touch Biller Pro. 10. I LIKE IT WHEN YOU SAY 'NO LIMITS'. ARE THERE ANY STORAGE LIMITATIONS? Each In Touch EMR account comes with unlimited storage. There is no fine print. There are no limits for storing patient records. We also backup all your files at regular intervals. Software updates are also performed automatically at no extra charge. 11. WHAT IS THE COST OF IN TOUCH EMR AND IN TOUCH BILLER PRO? The cost for In Touch EMR is $49 per licensed clinician per month. There is no contract for In Touch EMR, no hidden fees and you can cancel at any time. Once you cancel, all your data will be archived immediately and you will not be billed further. This $49 charge is for licensed clinicians only, which means that if you have a practice with TWO licensed therapists, TWO aids, ONE front desk person and ONE biller, you will pay for the TWO licensed therapists, which is $98 a month. There is no separate license fee for additional staff members (non-licensed clinicians) however, each user with a unique credential (a username and password) is subject to a $10 monthly fee for ongoing program access, customer support, server utilization and personalized rights/capabilities. There is also a nominal, additional monthly fee for PTAs, COTAs and other non-therapist providers to schedule and document in In Touch EMR. In Touch EMR analytics is an additional feature, please call customer support for pricing information. 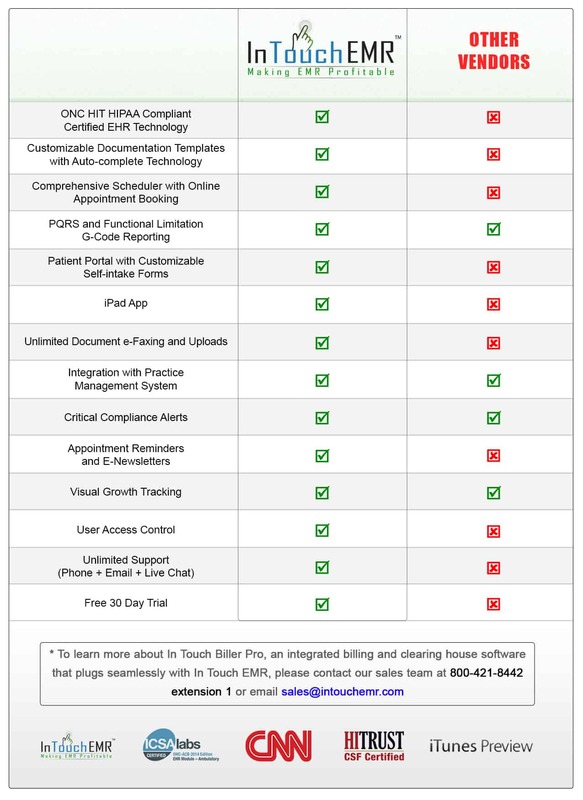 If you upgrade to In Touch Biller Pro (the billing add-on, integrated with a clearing house), you will pay a flat fee of $149 per licensed clinician per month. This includes unlimited eligibility verifications, unlimited electronic claims submission and unlimited ERAs (electronic remittance advice) per licensed clinician. There is an annual contract for In Touch Biller Pro, since we handle account setup, clearing house enrollments, integration with In Touch EMR and training. If you decide to get In Touch Biller Pro in addition to In Touch EMR, early termination fees may apply. Just as it is with In Touch EMR, the monthly subscription fee is applicable per licensed clinician. This means that if you have a practice with TWO licensed therapists, TWO aids, ONE front desk person and ONE biller, you will pay for the TWO licensed therapists, which is $298 a month. There is no separate license fee for additional staff members (non-licensed clinicians) however, each user with a unique credential (a username and password) is subject to a $10 monthly fee for ongoing In Touch Biller Pro access, customer support, server utilization and personalized access rights/capabilities. There is also a nominal, additional monthly fee for PTAs to schedule and have access to In Touch Biller Pro. The selection of an EMR and practice management system is a critical decision, and what you pay for is what you get. With our proprietary technology and tools, we actually save you money each month (use this savings calculator to determine your savings) and help you make more money each month (use this profits calculator to project your increased income). We’ll prove these savings and profits to you during your demo with us. Click here to schedule your demo of In Touch EMR and In Touch Biller Pro. This is a competitively priced software solution that will DRAMATICALLY increase productivity and cash flow for your practice. When you compare the cost savings (with the built-in automation we offer) and the increased profitability (with the increase in your revenue), you will see why the math makes sense very quickly. 12. I DON'T WANT TO LOSE ANY OF MY PATIENT DATA. CAN YOU RESTORE MY DATA IF IT IS EVER LOST? In Touch EMR automatically backs up all of your data at regular intervals, which is a HIPAA requirement. If your data needs to be restored, contact your account manager and we’ll retrieve your data from our most recent backup. 13. DO YOU HAVE ADDITIONAL ADD-ONS AND SERVICES? Yes we do. In Touch EMR has built-in plugins to help you market and grow your practice. Integrated text and voice appointment reminders help you decrease patient cancellation rates and increase patient satisfaction. Emailed/print/video newsletter integration allows you to communicate with your patients on an ongoing basis and grow your practice. Home exercise program integration allows you to generate online exercise programs to give to your patients. 14. WE ARE A REHAB CLINIC (PHYSICAL THERAPY AND OCCUPATIONAL THERAPY) AND ARE CONSIDERING ADDING SPEECH THERAPY AS WELL. DOES THE IN TOUCH EMR PROGRAM WORK FOR PTs, OTs, SLPs and also MHPs? 15. HOW MUCH TIME SHOULD I SET ASIDE FOR THE POSSIBLE TRANSITION? Training is a collaborative effort and we recommend you set aside 3-4 weeks for training and enrollments. We go to great lengths to get you up and running with In Touch EMR as quickly as possible and we expect your active involvement in getting the most out of the system. In Touch EMR mastery can be achieved in 2-3 hours with our self-paced, online video training program. In Touch Biller Pro mastery can also be achieved in 2-3 hours with our self-paced, online video training program. 16. CAN YOUR PRODUCT BE USED ON DIFFERENT DEVICES SUCH AS PC, MAC, ANDROID AND IPAD DEVICES? Yes. In Touch EMR can be used on an iPad, smartphone, laptop, computer and Android device; allowing you to work at the office, from home, or on the go. The entire application is mobile friendly. In Touch EMR can be used securely on any device with an Internet connection. If you are an iPad user, we have built a dedicated iPad app to streamline patient intake. 17. HOW CAN I CONTACT CUSTOMER SUPPORT? There are several ways to reach customer support. Our customer support team is waiting to hear from you. We are easy to reach – by phone, email, live chat or support tickets. 18. WHAT ABOUT SOFTWARE UPDATES AND FEATURE IMPROVEMENTS? DO I HAVE TO PAY EXTRA FOR THEM? Our system is updated automatically at no extra cost to you, so you get the latest version and enhancements without paying anything extra. We’ll notify you every time there is a feature update to our system. 19. HOW RESPONSIVE IS YOUR SUPPORT STAFF? CAN I GET SOMEONE ON THE PHONE WHEN I NEED IT? Absolutely. You can get in touch with your In Touch EMR account manager, by phone or email. You can also click here to reach the In Touch EMR support team on the ‘Contact’ page on our website. Our toll free number is (800) 421-8442. Depending on your account status, you will have access to a designated account manager as well. The email for sales is sales@intouchemr.com and support is support@intouchemr.com. You can also click here to contact our helpdesk. Clients also have a live chat option during regular business hours. 20. I HAVE BEEN USING SERVER-BASED SOFTWARE FOR A LONG TIME. I AM CONSIDERING A SWITCH TO A WEB-BASED PRODUCT. IS IT BETTER? If you were using server-based software, installation, servers, backups and updates are generally your responsibility and would need to be done on your end. You would need to back up your own patient records and update your software by yourself at regular intervals. 21. WHAT IF I HAVE MORE THAN ONE CLINIC? HOW MUCH EXTRA AM I PAYING? With In Touch EMR, the billing calculation is simple and hassle free. In scenario one, there are five (additional) users, billed at an additional $50 per month ($10 per user per month). In scenario two, there are two (additional) users, billed at an additional $20 per month. Therefore, scenario one costs only $30 more per month. All these users get full access to everything in In Touch EMR. With our competitors, you will pay significantly more in scenario one, potentially hundreds of dollars more. You’ll pay for ‘access to the scheduler’, ‘access to documentation module’ and other things you thought were included. In fact, some companies follow a ‘dynamic pricing model’ and sales representatives are encouraged to charge for modules based on what the client can afford to pay. When you finally see the charge, it’ll be higher than you originally thought. There will be hidden fees and fine print. We keep things simple and transparent. You pay a monthly fee for each licensed provider for In Touch EMR and In Touch Biller Pro, with a nominal monthly fee for each additional user. All core features like scheduling, documentation, reporting and billing are included. Some features like analytics, appointment reminders and e-newsletter marketing are significant product upgrades, and hence they carry an additional fee. 22. DO YOU HAVE A STUDENT / EDUCATOR DISCOUNT? Physical therapy students and educators do get a discount towards In Touch EMR and In Touch Biller Pro. Please email sales@intouchemr.com or call (800) 421-8442 extension 1 and we’ll be happy to help. 23. CAN I KEEP MY CURRENT BILLING SOFTWARE / BILLER AND STILL USE IN TOUCH EMR? Your billing service can run a claim summary report in In Touch EMR, and then enter claims into your preferred billing software and clearing house. Having said that, the seamless integration of In Touch EMR with In Touch Biller Pro allows automatic claim transmission from one to the other. Ask your biller to schedule a demo. They’ll most likely see that In Touch Biller Pro is a better solution than the one they are currently using. It gives them more control and flexibility, and allows your practice to get paid more, faster. This is exactly why billing services across the country are switching over to In Touch Biller Pro. 24. CAN IN TOUCH EMR SUBMIT CLAIMS ELECTRONICALLY AND GET BACK ELECTRONIC REMITTANCE ADVICE (ERAs)? To bring you the best possible billing software (real-time eligibility verifications, batch claims submission and more), In Touch EMR has partnered with one of the largest clearing houses in the United States. Our clearing house, an Inc. 500 company, has submitted over $1 billion in claims, and over 21 million claims in the past 12 months alone. This add-on billing software (In Touch Biller Pro) costs $149 per licensed provider per month, and gives the provider (and staff) real-time eligibility, electronic claims submission and electronic remittance advice capabilities. All clearing house fees are included. This billing software alone will save you several hundred dollars a month and get you paid more, faster. Schedule your demo with us and learn more. The good news is – our clearing house will handle all provider enrollment, and help you get set up so that all your claims (generated from In Touch EMR) are seamlessly transmitted to In Touch Biller Pro. This allows you to get paid more, faster. If you have any questions about submission and/or denial of claims, our customer support will assist you by phone and email. You’ll have an integrated billing solution to streamline your practice workflow. 25. HOW DO WE TRANSITION OUR PATIENT LIST AND PREVIOUS MEDICAL RECORDS WHEN WE MAKE THE SWITCH TO IN TOUCH EMR? There are two steps to this process, and both can be completed in 1-2 business days. We’ll help you export your patient list (usually in an excel file) from your current EMR / billing system. On your behalf, we can work on this excel file, so it is ready for import into In Touch EMR. This process takes 1-2 days. We’ll also help you export your medical records (digital documents like PDF files) from your current EMR or refer you to a vendor that can help you with this. On your behalf, we can import these files into In Touch EMR. This process takes 1-2 business days. 26. DOES IN TOUCH EMR HAVE AN INTEGRATED HOME EXERCISE PROGRAM (HEP)? A Home Exercise Program (HEP) is an additional feature, and depending on the solution you use, there may be additional costs. Continue to use the HEP program you are currently using. Most clients use programs like VHI Kits or other free online home exercise program solutions. The HEP programs from these products (available in a PDF format) can be uploaded easily to the patient record in In Touch EMR. Upgrade to an advanced online HEP solution. We can recommend several HEP vendors, with added benefits such as unlimited HEP programs, website integration and patient exercise portal. There is an additional fee associated with such solutions. Contact us to determine if your preferred HEP solution is integrated with In Touch EMR. The patient can press 1 to confirm the appointment and 2 to reschedule the appointment, in which case he/she will be automatically routed to the clinic. These ‘advanced configuration’ options can be enabled or disabled by the clinic (advanced configuration options).Someone from your office can help prevent the cancellation, or help reschedule the patient. This feature comes at a nominal cost, and helps reduce patient cancellation rates, increasing revenue for your practice. 28. CAN I SPEAK WITH SOME OF YOUR CUSTOMERS BEFORE I MAKE A DECISION? Of course. When you are ready to make a decision, we’ll put you in touch with some of our current users who have agreed to share their experience with In Touch EMR. 29. WHAT DO I DO IF YOUR WEBSITE GOES DOWN, SINCE YOU ARE WEB-BASED? With web-based systems, there are two types of outages – planned and unplanned. In the event of an unplanned outage, our 24/7 team of engineers do everything possible to restore connectivity as quickly as possible. In the past 5 years, In Touch EMR has had one unplanned outage. In the event of any unplanned outage or downtime, the clinic is responsible for their own downtime policies and procedures. Impacted clients can use alternative systems, including but not limited to, pen and paper documentation and scanning in documents into In Touch EMR when system connectivity is restored. Along with our hosting partner, ClearDATA, our industry-leading security measures include around-the-clock monitoring, intrusion detection and prevention, data encryption in motion and at rest, dual-factor authentication, enterprise hardware, and more. Geographically distributed, top-tier rated, SSAE 16-compliant data centers enable us to offer industry-leading guarantees of almost 100% network uptime and almost 99.999% infrastructure uptime. We work to ensure that you will be able to access your data 24 hours a day, 365 days of the year. Our cloud infrastructure features the latest in enterprise-grade hardware from the top brands in computing, state-of-the-art data centers, multicarrier connectivity, advanced network configurations, 24/7 monitoring, and more. In the event of a planned outage (typically a software update or server maintenance), we provide our customers with at least two weeks advance notice by email. In addition, we do our best to schedule maintenance over the weekends and in the middle of the night (between 2 am and 4 am EST) to minimize any disruptions to your practice workflow. 31. CAN I PROVIDE FEEDBACK TO MAKE THINGS MORE USER FRIENDLY? Software development is an ongoing, iterative process so we welcome comments, suggestions and creative feedback from our users. Please contact our support team via phone, live chat or email for your suggested improvements and comments. Once a feature request is approved, it is escalated to the engineering team. Approval time for new feature requests ranges from 1-3 weeks and new feature development and deployment to users takes an additional 1-3 weeks. 32. CAN THE CLINIC OWNER/ADMINISTRATOR CONTROL PERMISSIONS AND DATA ACCESS FOR STAFF? The clinic owner and administrator are able to control who sees what, and limit the sharing of data between users. For example, financial information can be restricted for the clinicians and front desk in the billing software. Also, in In Touch EMR, the ability to finalize a note (and generate a claim) can be disabled/changed to ‘submit for review’ to a clinician for PTAs, COTAs and new clinical staff. These are just two quick examples. All permissions and privileges for users can be customized and controlled by the clinic owner/administrator. 33. WHERE CAN I REVIEW THE USER AGREEMENT AND TERMS OF SERVICE OF IN TOUCH EMR? To learn more about our user agreement and terms of service, please contact a sales associate at 800-421-8442 or Click Here to Submit a Support Ticket.